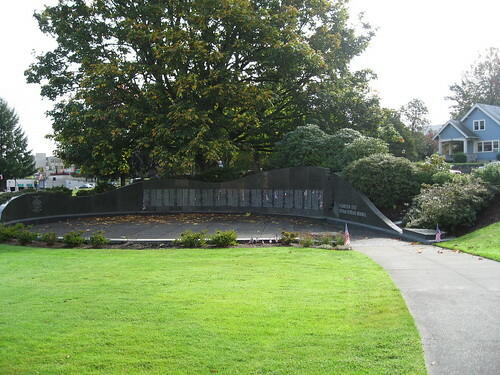 After I got home from Desert Storm, I visited the Vietnam war memorial in Olympia, Washington. I’d gone there before the war, but I felt the need to revisit it. The picture below is from Flickr and taken by George Berend. Screen readers: The memorial is a green granite wall with etched columns with lists of names in white. A walkway leads into the memorial from the right, ending in a circular area in front of the wall that is shaded by trees. The trees frame the memorial, but we can see a blue house on the right and city buildings on the left. The visual impression I get from these outside elements is that the placement of the memorial feels like an intrusion on the rest of the world. Usually when I went to the memorial in the past, there was always a veteran from Vietnam present. This time I was alone when I followed the wall, looking at the names. It was like there was thousand voices whispering at me that I was part of this. Then a name caught my eye: Beverly. A woman? Instantly, that one name connected to me across time. 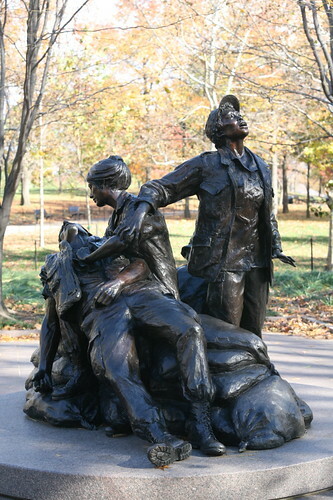 Women vets were not largely recognized at the time. There would be a huge controversy surrounding a memorial for the women that was eventually built next to the The Wall. The male veterans protested, saying the women didn’t need a memorial because they hadn’t done anything. Hundreds of thousands of women volunteered — some were directly in combat and some were killed. The memorial still was built, and it celebrates its 20th anniversary this year. For perspective, I came back from Desert Storm 22 years ago. Screen readers: Taken against the oranges of November, the sculpture shows a nurse sitting on a pile of sandbags, a dying soldier in her arms. A second nurse looking into the sky as if to protest to God. Visiting a memorial after you’ve been at war is a haunting experience. I wrote my experiences for the anthology Voice of a Soldier. What it’s like on a military post? Thank you for serving. We are so blessed and grateful to have such brave men and women in our military.